Adorable, right? This is an exciting time: so many of my friends are expecting! But the sad reality is that while I want to give something handknit to all of them, I can’t shower each and every babe with a handknit blanket. PSA: Should you want me to knit your baby a blanket, please have him or her at a time that does not coincide with the births of other friends’ babies. Thank you :). With these hats I was hoping to accomplish the seemingly impossible: knit something tiny teeny, but still incredibly special. Handspun will do that to a gift ;). 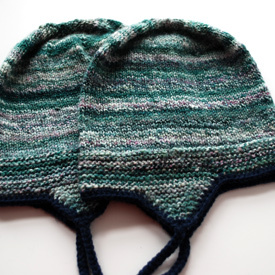 Pattern: Thorpe (link opens a pdf file) by Kirsten Kapur of Through the Loops Designs. See it on Ravelry. Yarn: Sock Hop Yarn, Good Vibrations colorway, from Crown Mountain Farms. Each hat used up about 100 yards (only 100 yards!) of this hand-dyed and handspun superwash merino yarn. One skein of sock yarn was pretty much perfect for making two of these hats, with only a few grams remaining. The contrast yarn is Louet Gems sportweight, 100% superwash merino in Indigo (16). This yarn is now thrice “leftovers” – I originally purchased it to make a pair of socks for my dad, then the leftovers found their way into this hat for Walter, the leftovers of which were used in knitting the Pod of Cetaceans Cardigan, and now those leftovers ended up as trim on this little baby Thorpe. And I still have a few yards left ;). Needles and gauge: I used Inox dpns, 3.00 mm (that’s about a US 2.5). Using those needles, this sportweight yarn knit to 6.5 spi and 10 rpi in my hands. I obviously had to modify this pattern a bit, both for a smaller size and thinner yarn. 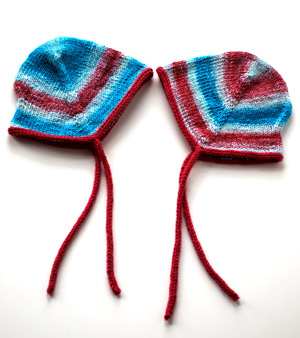 Luckily, a top-down hat pattern is incredibly easy to modify as you go. I increased until I had 88 stitches, then knit even for 4.25″ before beginning the garter stitch portion. This resulted in a hat that is about 13.5″ around and 7.25″ from crown to where the earflaps start. 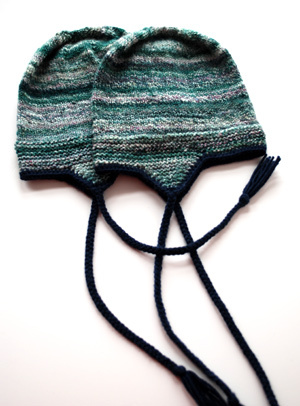 When I knit the second hat, I made it a hair more shallow (the first seemed a little too long to me) by knitting even for only 3.75″, so the finished hat was 6.75″ deep overall. Oh, I used Kathryn Ivy’s modifications for a jogless join in garter stitch, and it worked out perfectly. Pattern: Top Down Bonnet with Anime Character by Adrian Bizilia of Hello Yarn. See it on Ravelry. Yarn: Hand-dyed and handspun superwash merino in the Retro Kitchen colorway from Missy, A Tree Hugger’s Wife on Etsy. This was a custom order that I told you about a little while ago. Yup, it’s the same yarn! Knits up stripey, as it ends up! Each bonnet used up only 65 yards of this yarn! The contrast yarn is Louet Gems sportweight, 100% superwash merino in Crabapple (26). Needles and gauge: I used two US 5 circular needles to knit this project, an Addi and an Inox Express, I think. My gauge was 5.75 spi and 9 rpi. Those of you who remarked that this bonnet looks a lot like a sock toe are precisely right! It’s knit as you would knit a toe-up sock. So, I started with the inimitable Judy’s magic cast-on, and followed the pattern instructions for the smallest size. When time came to knit the garter stitch border, I knit a few rounds even, and worked an i-cord bind-off using the contrast color. Two i-cord ties later, and voilà! I wasn’t sure how to measure the finished dimensions of this hat, but it’s about 6″ from the crown to where the tie starts. So simple, so nubbly, so squishy and delicious. I’m so glad that this type of handspun doesn’t allow a complicated pattern, because I was glad to knit stockinette and garter stitch for a change. It allowed me to focus entirely on the formation of the stitches – all different, transforming in color, thickness, and texture right before my eyes. Maybe these hats aren’t as impressive as a giant shawl, but I enjoyed knitting them so much. That’s why there are four of them, and more to come. Good lord, those are sweet! Great pattern/yarn combo choices. Lovely little hats! How cute are those? Great choices. And they look beautifully made. Wow, this is brilliant. And all superwash yarn? The parents will love you. Such wonderful patterns, such lovely yarn. Lucky babies! Super awesome! I’ve been eyeing (sp?) the Thorpe pattern for awhile and this has me even more convinced I need to download and start using it. How ingenious and cute as a baby gift! They are adorable! 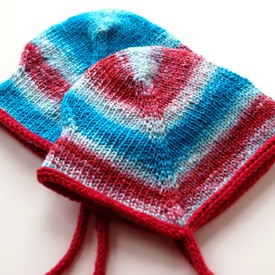 As a parent, I’d say that tiny babies need hats much more than a blanket, so you did good and don’t feel sad that you can’t knit a blanket for each newborn. Yay! I recognize one of those hats very well. 🙂 Your workmanship is second to none – as is your generosity. Thank you so much!!!! Very cute! I love making hats, though I usually end up making them from the brim. I really should try top down. Adorable! 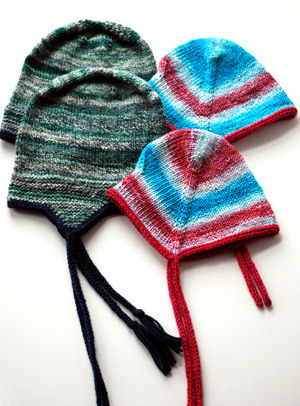 I’m always looking for good baby hat patterns and these will definitely be joining my queue. Lucky babies! Lucky friends! Such sweet gifts. I think they are just as impressive as shawl. It takes just as much skill to take handspun yarn and turn it into something cute and wearable, as it does to follow a complicated lace chart. The hats are simply adorable! There are sure going to be group of well dressed babies in Boston soon time soon. Beautiful hats. I have a question re: an old post…when you knitted the Mary Maxim Buffalo sweater I noticed you used worsted while the recommended yarn was heavier. Did you do a lot of adjustments to the pattern or did you just use a bigger size on the pattern to compensate for the worsted weight yarn? Great solution to a quandry. I am knitting for co-workers in my newish job who aren’t close enough to me to warrrant an heirloom blanket and who also are showered with blankets from others. These are so cute! And the Retro Kitchen yarn turned out very nice. What a great idea for using up small quantities of handspun. Very nice work. I can sympathize with you on the baby thing. In my family, we have two who are due in July, weeks apart. How in the world am I supposed to knit blankets for them and do everything else I need to knit? One is due July 6th and the other is due July 16th. The hats are just too cute. I know they will love your present. I just love everything about these hats. They are wonderful! The little hats are so amazing. Thanks for all the good details on how to make them. Love the hats. I’m dying to knit Thorpe, but everytime I try – I cannot get the hang of knitting only 4 stitches on DPN’s! Any tips? Love these hats. They cover the ears so well–will certainly keep little heads good and warm! Yummy! Baby-sized Sockhop Thorpes rock. Super cute! I’m curious how they fit the babies. Does one shape fit better than the other on a baby’s head?